Paolo Pablico and the Falcons make it nine wins in 13 matches. 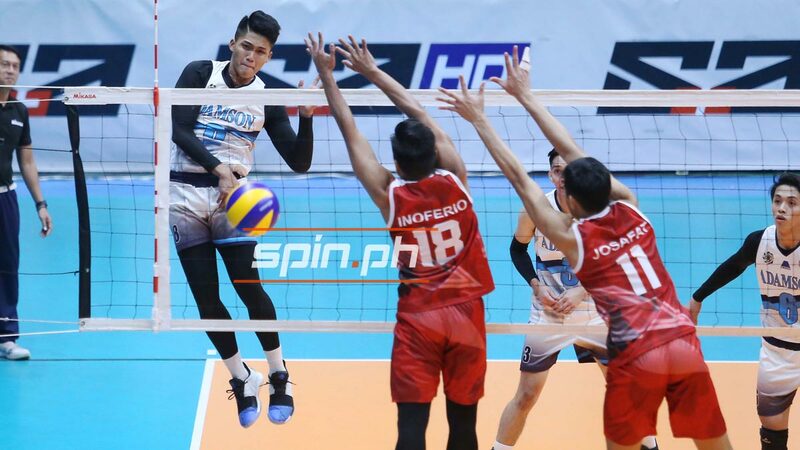 SEMIS-bound Ateneo and Adamson took down ousted teams to keep their share of the third spot on Saturday in UAAP Season 81 men’s volleyball tournament at the Smart Araneta Coliseum. Tony Koyfman scored 17 points as the Blue Eagles beat University of the East, 25-20, 25-12, 27-29, 25-15. Koyfman scattered 12 attacks, four blocks and an ace, Ron Medalla scored 12, Gian Glorioso had 11 points, while Chumason Njigha and John Rivera added nine markers each. UE slid to 2-10 with Angelu Alba the lone double digits scorer with 11 points. Meanwhile, Paolo Pablico erupted with 18 points to lead Adamson past also-ran La Salle, 25-14, 23-25, 25-19, 25-19. Leo Miranda put up an all-around game with 13 points, 17 excellent receptions and 13 digs. George Labang Jr. had 10 markers, Jeffrey Alicando scored nine and Royce Bello added eight. National University leads with a 10-1 record followed by Far Eastern University at 9-2. Ateneo and Adamson have 9-4 win-loss records. They clash on April 28 at the Arena in San Juan. Cris Dumago had 18 points for La Salle, which dropped to 4-8, tied with University of Santo Tomas. La Salle faces UP (1-10) while UE battles UST on April 27.